And for cause! Already almost 72 days of sea, without interruption, with only companion a regulator of allure on whom it must be counted, with whom it must be made, which must be understood all the subtleties to draw the best and continue to advance the As soon as possible, even if the finish line is still difficult to imagine... Jean-Luc van den heede can at least satisfy himself for spending half of the Indian, this ocean and tricky ocean that puts the threat without rest From the break, by its dangerous waves and violent winds.
" there is always sea, it does not stop... He added yesterday... but the least we can say is that this great sailor bends with an insolent brilliance to this routine azing. Look at his trajectory, compared to the erratic ones of his pursuers. Since its entry into the great south, the leader of the race runs straight, at good speed, sometimes worn by the current, in line with the wind and the strongest sea, blocks always pointed east! Behind it is once more complicated and its competitors must envy the fluidity of its wake. Mark slats has to face the winds of East-North-East, which runs off the road and force him to climb north, in a sea messy by wind variations. 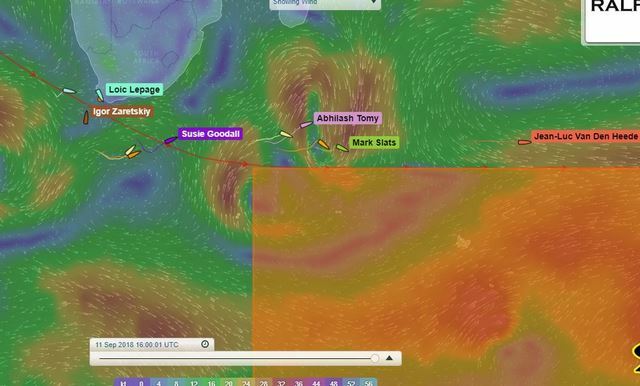 Still 700 miles behind uku, Susie Goodall is moving a path into a troubled system that could greatly brake his progression tomorrow, by opposing his bow a band of high pressure or North-East winds. Mark Sinclair will escape to the biggest of this wind but will still be late by slowing down to drop his film films at table bay, near Cape Town from where loic lepage should jump tomorrow, water reserves!